This Saturday, March 26th, The Legal Genealogist is getting together with a whole bunch of Maryland genealogists at the Enoch Pratt Free Library in Baltimore for the Pratt Annual Genealogy Lecture — four lectures, in all, focusing on genealogy and the law. To be precise, these lectures: That First Trip to the Courthouse; Finding the Law; Making a Federal Case Out of It; and The Ethical Genealogist. So, of course, in preparation for these, I had to spend some time poking around in old Maryland statutes, and anyone who regularly does Maryland research knows what I found. 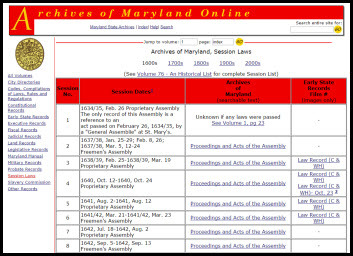 I mean, seriously, the Archives of Maryland Online couldn’t make it much easier to do research into Maryland laws starting as far back as the Freemen’s Assembly of 1637/38 and as far forward as the Session Laws of 2014. Both in word searchable text format and in digitized volumes of early records — often records microfilmed by the Library of Congress — the site has compiled about as comprehensive an online library of state law as exists anywhere in the United States. And it’s all readily available for any of us to work with, even at 3 a.m. as we sit at our computers in our bunny slippers. Wonderful resources, full of both direct genealogical information and the laws that let us understand the records we find. Thanks, Judy. Your timing for this post couldn’t be better for me. I just started searching for my husband’s Dean and Ellett ancestors in Maryland yesterday; his 3rd ggrandparents and their oldest daughter were born in Maryland and migrated to Indiana between 1810 and 1815. I was just looking at the Enoch Pratt Free Library website and a few others yesterday, but hadn’t come across the Archives Online yet. Hooray! Glad this hit the spot for you! This is great for Maryland’s laws. Some of my wife’s ancestors came through Maryland. What about the statues of other states? Is there a general answer for the type of websites to search for the state statutes? The state archives? The state attorney general? The state historical society? The state genealogical society? Is there one site that links to all 50 states? Then within the website, how do you narrow down the law in effect at a particular time period? If you want to know what law was in effect in, say, 1828, the year 1828 won’t help except in the rare case that a law was passed on that subject in 1828. It sure would be nice if there was one-stop shopping for all the early state statutes, but the only place that has them all is the subscription site HeinOnline and its Sessions Laws library — and 24 hours will cost you $25. Other than that, it’s a state-by-state, case-by-case situation as to whether all of the session laws are online at all. As for narrowing it down to a particular law, I teach a whole course on that topic… because there are multiple methods of getting to the right law for the right time. Not something that can be readily answered here.